Whether you’re looking at a car or a dirt bike, the same aspects of comparison apply when drawing comparisons between a 2 stroke and a 4 stroke – it all boils down to the engine. This article explains how these two types of motorcycles stack up against each other. A 2 stroke dirt bike is powered by an internal combustion engine capable of completing a power cycle with two strokes of the piston in one crankshaft revolution. As the piston in the combustion chamber rises, it gets filled with a balanced mixture of air, oil, and gasoline. This mixture is compressed and then is ignited by the spark plug. This action causes an explosion which forces the piston to move back down. This cycle repeats over and over. So, that’s two strokes (the up and down movements) of the piston for every ignition. A 2 stroke engine has no valves and can produce power for quick acceleration. However, 2 strokes cannot match the amount of torque 4 strokes can produce. In addition, many pro riders agree that 2 strokers are difficult to handle in tight courses. A 2 stroke engine cannot lubricate its crankshaft bearings, cylinder wall, and connection rod except by introducing a high performance 2 stroke oil to the fuel. However, this practice has been criticized for causing high levels of pollution. This has prompted advancements in engine technology that includes fuel injection and clean burning 2 stroke engines. A 2 stroke dirt bike does not have too many moving parts, which gives it a nimble and lighter feel. This also means that a 2 stroke does not require expensive, regular maintenance and is also easier to rebuild. The 2016 Kawasaki KX65 (a 2 stroke) is currently priced at $3,699, while the 2016 Husqvarna TE300 is $8,899. The Yamaha YZ250F 2016 model is $7,390. In 4 stroke dirt bikes, an internal combustion engine “fires” with every two revolutions of the crankshaft. Its engine has four main functions, namely: intake, compression, combustion, and exhaust. 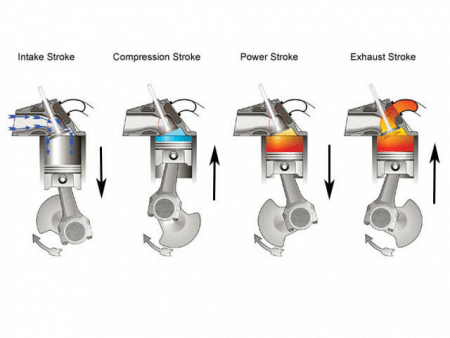 The 4-stroke cycle starts with the intake or induction. As the piston moves up and down the cylinder block, a mixture of air and fuel enters the intake valves and goes into the cylinder. The second stroke is compression, where the valves close as the piston rises to compresses the fuel mixture. When the piston reaches the top of its stroke (i.e. top dead center or TDC), the spark plug then ignites the fuel mixture to explode which drives the piston back down. This is the third movement called combustion. The fourth stroke is called exhaust, which involves the exhaust valve opening up to release the emissions in the cylinder and out the exhaust pipe. The whole process repeats itself over and over. A 4 stroke dirt bike engine does not require fuel in the crank case. Thus, the crank case can be filled with heavy duty oil for lubrication. Moreover, less gasoline consumption results in fewer emissions, making 4 stroke engines less damaging to the environment. In terms of handling, a stock 4 stroke dirt bike is obviously heavy due to its many parts. However, many aftermarket parts and superior suspension set ups can easily resolve handling issues. With so many moving parts, a 4 stroker typically requires a professional mechanic for regular maintenance work. The 4 stroke 2016 Kawasaki KX450F is $8,799, while lower-priced models such as the 2016 Kawasaki KLX110L is priced at $2,499. The 2016 Beta 500RS Dual Sport is currently at $9,799, while the 2016 Honda CRF50F is at $1,399. So what’s the difference between 2 stroke and 4 stroke dirt bikes? A 2 stroke dirt bike is set up with an engine that produces power in a single crankshaft revolution. In contrast, a 4 stroke engine fires on every second revolution of the crankshaft. A 2 stroke engine, as the name implies, involves two strokes or movements – compression and combustion. A 4 stroke engine has four movements which are intake, compression, combustion, and then emission. A 2 stroker can only lubricate by adding a special high performance oil to the petrol while a 4 stroker has an empty crankcase which can be filled with oil to lubricate moving parts. Depending on the manufacturer, price points for both 2 stroke and 4 stroke dirt bike vary widely, with 2 strokes costing relatively less. The 4 stroke 2016 Beta 500RS is priced at $9,799 while the 2 stroke Beta Xtrainer costs $7,299, for example.